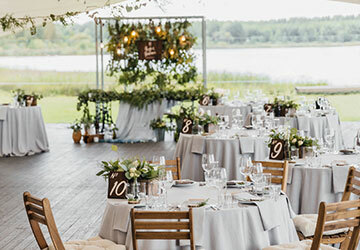 If you’re finding yourself overwhelmed with the millions of wedding options in today’s market, it may be time to consider a minimalist wedding look. Minimalism doesn’t just mean getting rid of unnecessary extras – it’s also a style in itself that makes any space look clean, open, and beautiful. Here are 5 Steps to Design a Minimalist Wedding. Going minimalist starts with taking out anything that might be unnecessary. Tons of signage, big and complex seating chart displays, and even favors can be scaled back or cut out entirely. Go for functionality in all elements of your wedding day. Opt on the side of smaller items to avoid crowding the space, and find simplistic designs for signs and stationery to get the job done without too much flair. Keep it simple, and keep it neutral. Designing a minimalist wedding centers around the color choices. White and green is a gorgeous wedding color palette with lots of opportunity for lush accents and simple white furniture and décor. An earth-toned palette featuring brown, tan, or taupe is another great option, especially for an outdoor wedding. If you just can’t picture your big day without your favorite bright hue, just pair it with one neutral color, like white or black, to keep the palette simple while adding a personal splash of color. Ceremony backdrops have the potential to be a dramatic focal point of the evening. Take it down a few notches by focusing on one simplified piece of décor to frame the space to say I do. A copper pipe arch or a garland hung on the wall can mark the spot without crowding it. Aisle decorations can also be cut to a minimum, or left out entirely, to keep the focus where it should be: on you! There is a time and place for ornate flatware, printed dishware, and grand candelabras, but a minimalist wedding is not it. Restrict the tableware to what’s necessary, functional, and looks good. Opt for plain white plates or solid colored stoneware, streamlined flatware and glassware, and super simple decor. To keep it from looking too boring, find places to incorporate a small amount of color against a neutral background. Part of the minimalist lifestyle involves cutting back on the waste most people produce on a daily basis. Disposable plates, cutlery, and cups are harmful to the environment, and when produced in mass quantities like at a wedding, it can become a real issue. Anything disposable can usually be replaced with something reusable. Renting the items you need instead of buying them lowers the impact on your time and budget, while still being environmentally conscious.